Roasted Bell Peppers – Go Ahead & Burn Them! When you see deals on bell peppers or chilies, stock up and buy 12-24 of them. Roasting your own peppers is an easy, economical way to add gourmet flair to your recipes. They keep well when packed in olive oil or frozen. Great for making sauces, on cheese, sandwiches, salads, or meat. The sauces you can make from them offer a welcomed change from the usual tomato based sauces and pair well with spiralized vegetables (perfect for zucchini) or pasta, and as a bed for or drizzled over chicken and fish. Here is an instance where you want to burn them, go ahead and char until mostly black or blackish brown! Unless blackened and blistered, the skin will not remove easily. How do I do this without setting them on fire? Easy. 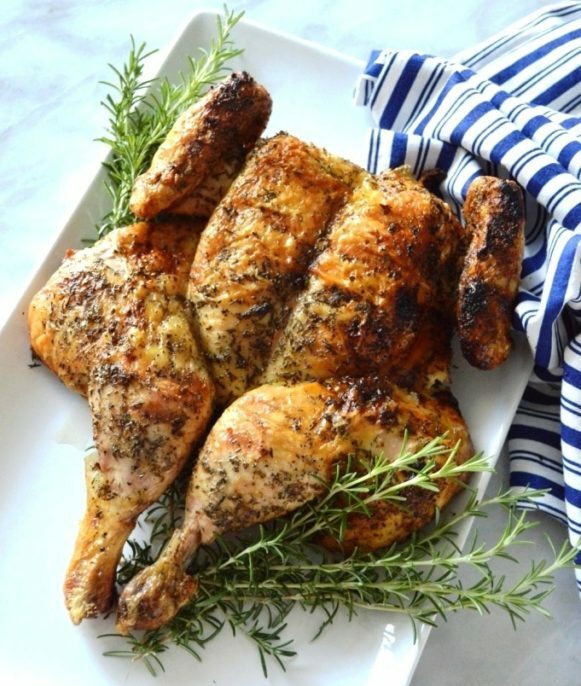 Grill: The grill is my favorite way and seems to produce the best flavor. 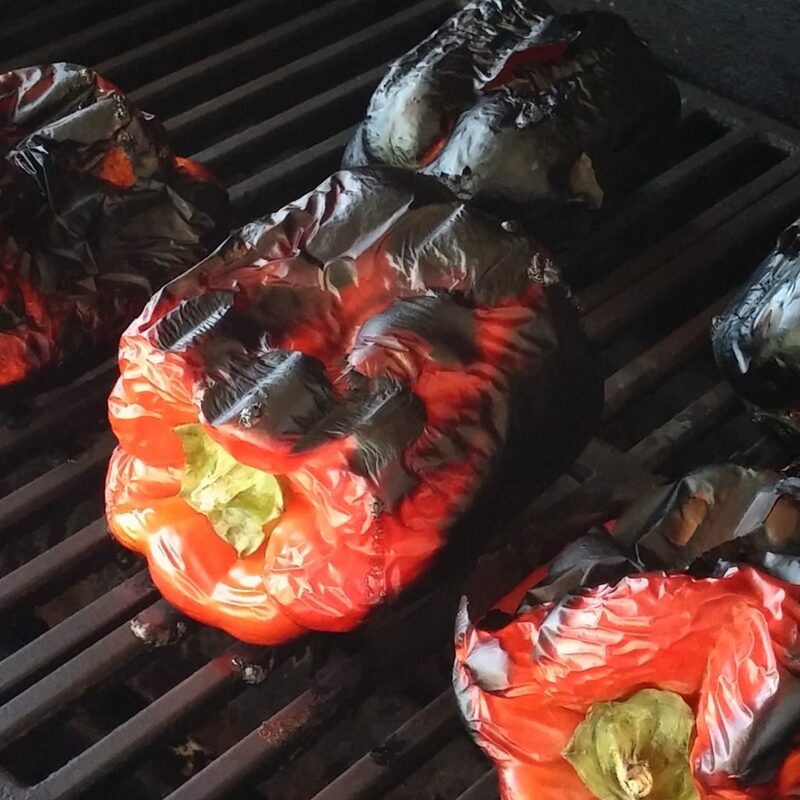 Place whole bell peppers directly on the grill top preheated to 400-425 degrees and roast with cover on or down. Check every 5 minutes and rotate. Cook time about 20-25 minutes. Gas Stove Top: Place directly over open gas burner and turn with tongs. Should be above flame, but not in flame. This method is best used when needing one or two bell peppers and definitely not recommended when processing large quantities. Cook time about 15 minutes for each pepper. How do I know they are done? Check the peppers after about three to five minutes. Rotate your pepper as needed until the skin has blistered and charred black on all sides. I know, it seems just wrong! Yes, you must almost entirely blacken the pepper’s surface. Can I char them too much? Well, yes you can. Stop when the most of the pepper’s surface is blistered and charred and only bits of color are showing through. The front middle pepper in the photo is a perfect example. When the entire pepper skin has charred on all sides, remove the pepper (or peppers) from the grill and place in a baking dish or large bowl, bottoms down. Seal tightly with plastic wrap, a lid, or a dish to prevent moisture from escaping. Hey, a cookie sheet works fine too as a cover. Let the roasted peppers rest covered for 15-20 minutes. This process releases the skin from the pepper meat as it cools. Don’t let them cool too long or the skins will re-attach to the flesh. Peel the peppers; the bell pepper skin should slide off easily and don’t worry if bits of char or skin remain. Remove seeds and stems. If not using immediately, toss and coat generously with olive oil, a tablespoon vinegar, and salt. Pack into clean small canning jars and cover with additional olive oil. These will keep up to a couple months in the refrigerator. Bring to room temperature before use.